Microsoft MakeCode Arcade is a web-based beginner-friendly code editor to create retro arcade games for the web and for microcontrollers. 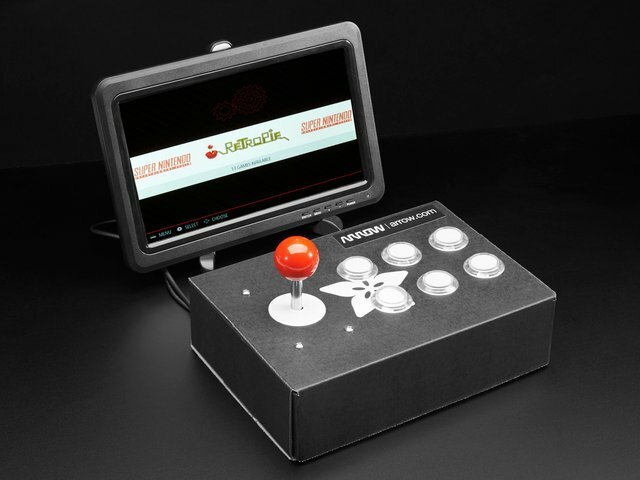 In this guide, you will learn how to assemble your own Arcade hardware from different parts. MakeCode Arcade is open source on GitHub. Arcade is for retro 2D sprite-based games. Arcade supports a 160x120 screen with 16 colors, and has a 2D game engine with sprites, platformer-style collisions, tile maps, particle systems and more! Arcade is a web-based code editor. Arcade is friendly to beginners! Get started with building your own retro games, using the block editor and the many guides. You don't need to be a programmer to get started! Arcade is friendly to seasoned programmers too! Arcade runs on hardware (in particular SAMD51)! While all games can be shared and played via the web, the fun starts when you compile them for SAMD51-based boards, like the Adafruit Itsy Bitsy M4 Express. This guide will show you how to build a MakeCode Arcade from a Raspberry Pi Zero. If you are looking for Adafruit M4 boards, try this guide. If you want to get all in a single kit, get the budget packet. If you don't feel like soldering, get the Pi with headers. For the experts, add headers, power cables, HDMI cables and converters as needed! You can also get Joy Bonnect Pack with Pi Zero which includes many of the components. A Pi Zero and Bonnet ready to go! Just one of the many available buttons! If your SD card comes with files on it, delete them, or just format the SD card as FAT32. Then download the ZIP file below, unzip it, and copy all files to the root directory of the SD card. After this, there should for example file named 9.0.3.gz in right in the root folder of the SD card. There should not be an arcade folder on the SD card. The ZIP below above contains binaries built from https://github.com/Microsoft/uf2-linux . If you're using the Joy Bonnet, then congratulations, you're done! Just connect the Pi using HDMI cable to a screen, and using the MicroUSB cable to the computer. After a few seconds you should see a menu much like the one below. Move to the next section to download games to your Arcade. If you want to use a big joystick and buttons, it's quite easy! 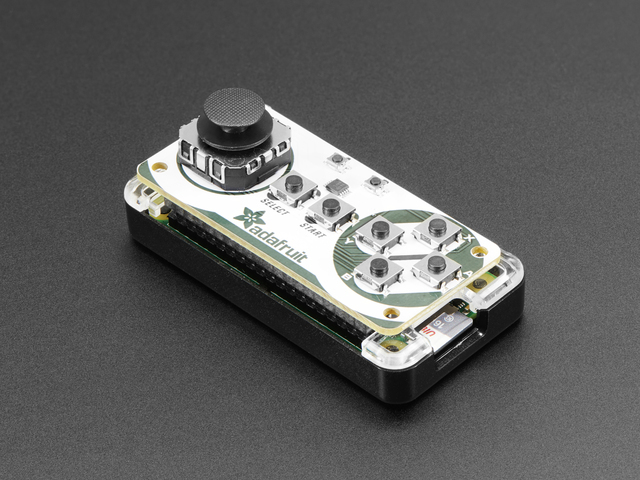 All you have to do is to tell your Pi where the buttons are connected. This is done by editing arcade.cfg file on the SD card. Feel free to connect them differently, just follow these instructions and update the file with the right GPIO numbers. To add new games head to https://arcade.makecode.com ! Press the Download button and say you don't want to pair anything if asked. You should then be given options to select type of board. Select Raspberry Pi (it will have the image of the menu above). This should create a file named arcacde-something.uf2. Copy it to ARCADE drive that should be visible on the computer to which your Pi is connected with the USB cable. If the ARCADE drive doesn't show up, make sure the USB cable is plugged into the USB port on the Pi that is closer to the HDMI port. The other one is power-only. If using a case, make sure it's plugged all the way in. There are plenty of ways to share games with your friends, family and anyone else who you think might enjoy something you've created! Let's quickly go over a few of your options. Click on the Share button and follow the steps to upload a version of your game online. It will generate a URL for you. Anyone with the generated URL will be able to play in a full screen mode, or edit your game! They'll also be able to download it onto their own Arcade if they have one. This page supports oEmbed and other various embedding options. Click the disk icon will save your code into a PNG image. You can import the image back or simply drag and drop it into the editor to reload the code. The image below contains the falling duck game. You will literally want to download the image itself - its a polyglot file that contains data within its pixels! Downloaded .uf2 files also contain the game code. You can import them or drag and drop them into the editor to reload the code. You can also use GitHub repositories to store and share your code. This is particularily useful if you end up building a lot of code or if you want to share an extension with other users. Read all about getting started with GitHub at https://makecode.com/extensions/github-authoring . This guide was first published on Jan 18, 2019. It was last updated on Jan 18, 2019. 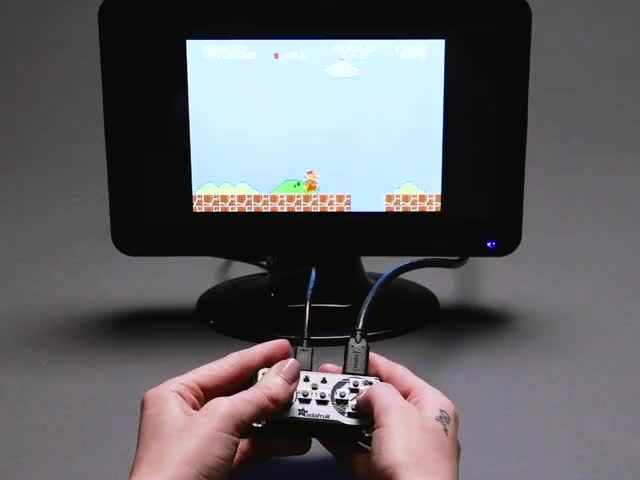 All-in-one game emulator/controller built inside a NES cartridge using Joy Bonnet and Raspberry Pi Zero! Create your own arcade games with MakeCode Arcade. No coding experience necessary!